The Jaguar XJ (X350) is a full-size four-door luxury sedan/saloon manufactured and marketed worldwide by British automobile manufacturer Jaguar Cars for model years 2003–2009 as the third generation of the Jaguar XJ saloon — carrying the internal designation X350 and the internal designation X358, following its 2007 intermediate facelift. Both the X350 and X358 were available with a six-speed automatic transmission, a range of gasoline and diesel engines (V6, V8 and supercharged V8), numerous trim levels — and short wheelbase (2003–2009) or long wheelbase (2005–2009) configurations. Extended-length models were the longest vehicles Jaguar had manufactured. The X350 was noted for its advanced electrical systems, self-leveling adaptive air suspension and full aluminum monocoque chassis and bodywork, among the first for a mass-produced automobile the bodyshell (body in white) was 40 per cent lighter and 50 percent stiffer than its predecessor, despite its increased overall size. Styling of the seventh generation was a conservative evolution of the previous XJ's styling; its slatted grille deliberately recalling the grille of the original 1968 XJ. Exterior stylng was by principal designer Tom Owen along with Sandy Boyes, under the design directorship of Geoff Lawson, who died midway through the project, and his successor Ian Callum. the XJ's interior was styled by Giles Taylor. Manufacturing took place at Jaguar's Castle Bromwich Assembly in Birmingham. With an unpainted and highly polished example of its all-alloy body shell on display, the X350 debuted at the 2002 Paris Motor Show. The full X350/358 generation largely coincided with Jaguar's ownership by Ford's Premier Automotive Group — until Tata Motors purchased Jaguar in 2008. Production ended in March 2009 after seven years with a total production figure of 83,566 units. The X350's aluminum bodyshell used a aerospace construction method, a hybrid of adhesive bonding and rivet joinery and known as rivet-bonding or riv-bonding — an industry first in volume automotive production. Both chassis and body formed an aluminum monocoque structure. Using aluminum rather than steel required new techniques, technological development and production layout along with significant investment. The stressed aluminum unibody used 15 aluminum castings, 35 extrusions and 284 stampings bonded using 120 yards of robotically-applied, heat-cured, aerospace-grade epoxy adhesives and approximately 3,200 self-piercing zinc-coated, boron steel rivets — Jaguar's first use of self-piercing rivets. In addition to the rivets, which do not require a predrilled or punched hole, each rivet making its own hole on insertion, the process also uses a small number of nuts, bolts, and spot welds. Castings and extrusions accounted for about 11 percent of the XJ bodyshell. To ensure manufacturing feasibility, numerous styling elements required redesign to accommodate forming in aluminum rather than steel, including the hood/bonnet profiles, especially around the headlamps; the radii in the fender-to-bumper gaps and the rear fender/door shut pressing; the side light configuration and the bodyside ‘haunch’. Chief Program engineer Russ Varney said the XJ also taught Jaguar "about the springback of stamped parts, where the pieces won't keep their exact shape." To reduce front-end collision repair cost and ameliorate increased insurance rates associated with aluminum construction, the body was designed to withstand an impact of 10 mph without structural damage and used a bolt-on front-end module (BOFE). A hydroformed aluminum extrusion with an energy absorbing foam cover formed a bumper beam cross-member, to provide strength and crushability in the event of a minor collision. Sacrificial extruded aluminum "crash cans" were designed to protect the body structure and front-end componentry. Steel is used for front and rear subframes and magnesium (as strong as aluminum while 30 percent lighter) is used for seat frames and lateral instrument panel beam. Jaguar had previously and prominently used aluminum construction, in the XK120 which was produced in the 1940s and used aluminum panels, along with its C‑Type and D‑Type racer cara as well as the 1960s E-Type which used aluminum chassis and body design. Ford retained the bonding and riveting patents of the XJ's aluminum monocoque body, when it sold Jaguar to Indian automobile manufacturer Tata Motors in 2008. The X350 employed a multi-link layout with four-wheel self-levelling adaptive air suspension instead the previous generations double wishbone IRS. Suspension was controlled electronically, requiring no intervention from the driver, to adjust damper settings (in milliseconds) and adjust ride and handling under varying conditions — its electronic control system marketed as Computer Active Technology Suspension (CATS). The air suspension was designed to activate every 24 hours to level the vehicle when parked and not in use. From the previous generation, the overall body was wider, longer and higher — with increased head, leg, shoulder and cargo room — and carried a .32 coefficient of drag. Door shut lines were engineered uniformly to a 3.8 mm gap to adjacent body elements. The hood and trunk were engineered to 3.5 mm to adjacent body elements. The doors opened to 62 degrees front and 65 degrees rear. The long wheelbase model, introduced in 2005, was the longest vehicle Jaguar had manufactured at the time. With a five inch extension behind the B-pillar (i.e., the rear doors were 5 inches longer), the extended model had a 3,159.8 mm (124.4 in) wheelbase and overall length of 5,214.6 mm (205.3 in) — the bodyshell's weight increased by 24 kg (53 lb) and the roof height increased by 7 mm (0.28 in) over the standard wheelbase XJ. Turning radius was increased by 13 inches over the standard wheelbase model. The 12-volt wiring system used multiplexing to integrate four systems: low-speed, event-driven communications around the body; high speed powertrain system (engine, transmission, air suspension system and instrument cluster); fiber-optic communication protocol for telematics, navigation, phone, voice activation, audio and multimedia systems; and safety systems protocol. At introduction, standard equipment included mirror-matched walnut burl wood grain trim throughout the interior, piano-black center console trim, leather seating, wood-trimmed steering wheel, leather-covered overhead assist handles, dual zone automatic climate control, glass electric tilt and slide moonroof with single-touch open/close, rain-sensing automatic wipers, automatic headlights, front fog lights, 24 lamp LED taillights, front and rear parking sensors, trunk/boot power latching mechanism, electrically adjustable steering wheel with memory and entry/exit function, electrochromic self-dimming side mirrors with compass, a trip computer, electrically adjustable pedals with 2.5 inch travel, 4 power points, all window one-touch up/down power operation, metallic paint (no cost option), a full-size spare tyre, electronically tilt and telescoping steering wheel, keyless entry, puddle lamps, electronic park brake, and 8-speaker, 320-watt sound system with trunk-mounted 6-CD changer and in-dash CD player. Safety systems included four-channel anti-lock brakes with emergency brake assist; traction control;, dynamic stability control; and front, side thorax as well as full-length side curtain airbags. Electronic coordination of seatbelts and airbags, marketed as Advanced Restraint Technology System (ARTS), was designed to sense crash severity, driver position and seatbelt status using ultrasonic and seat weight sensors to optimize airbag deployment force. Optional equipment included xenon headlights, headlight powerwash, adaptive cruise control, multi-stage heated seats, heated steering wheel, DVD navigation (with postal code programming where country-provided), soft-grain ruched (micro-pleated) leather seats and trim, electrically adjustable pedals and rear-seat multimedia entertainment system for CD listening or DVD movie watching via front seat head restraint-mounted video screens. At introduction, upper trim levels offered soft grain leather, leatherette fascia top and contrasting seat piping, inlain Peruvian boxwood trim, lambswool rugs, 320-watt, 12-speaker audio system, 4-zone heating and cooling system, 16-way adjustable front seats, rear heated seats — and optional electrically reclining rear seat and power rear center sunblind. The rear seating of long wheelbase models could be equipped with fixed or power-adjustable bench or individually powered and heated seats. The V8 engines remained in the new model, but were the revised and more powerful versions found in the 2003 S-Type. The 294 PS 4.0 L and 375 PS 4.0 L supercharged engines from the X308 Mk II were replaced by the S-Type's 300 PS (221 kW; 296 hp) 4.2 L and 400 PS (294 kW; 395 hp) 4.2 L supercharged units respectively, while a new 3.5 L V8 was also introduced for the European market which was derived from the 4.2 L engine and was rated at 265 PS (195 kW; 261 hp). The 243 PS (179 kW; 240 hp) 3.2 L V8 from the previous model was replaced by the 3.0 L V6 from the X-Type and S-Type. The V6 powers the XJ6, while the XJ8 was powered by a naturally aspirated V8. The XJR was powered by a supercharged 4.2 L V8. The XJ6 and the XJ TDVi are the only X350 models not sold in the Americas. In 2005, Jaguar introduced the diesel-powered XJ TDVi, featuring the same Ford-Peugeot-developed 2.7-litre twin-turbocharged V6 found in the S-Type. The engine, known as the AJD-V6, is rated at 204 PS (150 kW; 201 hp) and 321 lb⋅ft (435 N⋅m) of torque, and was fitted with electronically controlled active engine mounts to minimise vibration at idle. Both X350 and X358 used a six-speed automatic transmission manufactured by ZF Friedrichshafen. North American XJ models were equipped with the 300 hp (224 kW; 304 PS) naturally aspirated engine or an optional 400 hp (298 kW; 406 PS) supercharged 4.2 L V8 engine. The latter engine's valvetrain had a dual overhead cam design with four valves per cylinder and its top speed was electronically limited to 155 mph (249 km/h). At introduction, the XJ was marketed worldwide in numerous trim levels, including XJ8, XJ Vanden Plas and XJR in North America, and XJ6, XJ8, XJ Sovereign in the UK. For the 2005 model year, Jaguar introduced a long wheelbase variant of the X350. For 2007, the premium model was the reintroduced as the Jaguar Sovereign when the Super V8 and Daimler versions were dropped. Daimler Super Eight/Super V8: The Super V8, also known as the Daimler Super Eight, was the most expensive model, with the XJR being the second most expensive model in the range. The Super V8, which debuted in the 2003 model year in the new X350 body style, was initially of a short-wheelbase configuration. This became an option in 2004 when a long-wheelbase configuration was introduced, along with the supercharged variation of the XJ8 with the more luxurious Vanden Plas, or Daimler interior. Its primary competitor was the Mercedes-Benz S55 AMG. A distinctive wire mesh grille and chrome-finished side mirrors set the Super V8 and the XJR apart from the less expensive XJ saloons. In 2005, the Super V8 model was replaced by the Daimler Super Eight in all markets other than North America. The Daimler Super Eight was essentially the same car, but with the addition of a different grille, boxwood inlays finished in wood veneer and several other interior luxuries as standard. Daimler's US equivalent was no longer known as the Vanden Plas, but the Super V8. The Vanden Plas name was used on models that would be known as Sovereign elsewhere. Daimler has been the State Car for the British Prime Minister since the 1980s. Although this was replaced with the Sentinel trim in 2011 when the next generation of the XJ was introduced. Super V8 Portfolio: In early 2005, Jaguar announced the Super V8 Portfolio for the 2006 model year, a limited-edition trim level of the flagship Super V8 saloon. It debuted at the New York International Auto Show in March 2005 with a base price of US$115,995. The Portfolio trim level included a DVD player and 7-inch screens in the rear headrests. The Super V8 Portfolio, marketed in North American markets, became available in August 2005 and was exclusively available in two colors, Black Cherry and Winter Gold. The Super V8 Portfolio was powered by Jaguar's supercharged 400 PS (294 kW), 4.2 L, 32-valve, AJ-V8 engine with a top speed of 249 km/h (155 mph) and a 0 to 97 km/h (0 to 60 mph) acceleration time under 5 seconds. The facelifted X350 debuted in February 2007 for model year 2008 with a revised front grille and front bumper assembly featuring a prominent lower grille. A Jaguar emblem within the grille replaced the previous bonnet-mounted hood ornament. The front lights were revised and door mirrors incorporated side repeaters. The front fenders/wings had prominent faux side vents, and the side sills, rear bumper and tail lights were revised. The interior featured redesigned front seats. Models with the 2.7-litre diesel or with the 3.0-litre petrol V6 engines are also known as the XJ6 (since the engines have six cylinders), while the 4.2-litre V8 petrol engine mounted in the Sovereign results in that model being known as the XJ8. Also notice that the model list for the UK does not include the 3.5-litre V8 engine available in Germany, for example. Note: the XJ6 and the XJ 2.7D are not available in the US, unlike in Europe. The 'L' on the XJ8L badge denotes the long-wheelbase version. All engines were paired with a ZF six-speed automatic transmission. The XJ6 petrol versions have a lower final drive ratio. The Jaguar X358 TDVi was featured in an episode of BBC 2's Top Gear, where it drove from Basel to Blackpool Tower on one tank of fuel. Despite the 650-mile (1,050 km) pre-defined range, Jeremy Clarkson, who was driving the car at the time, had actually driven 800 miles (1,300 km), and after examining the tank, had enough fuel to do another 120 miles (190 km), making its range about 1,000 miles (1,600 km). Clarkson then described the car as "astonishing" and "the second most economical car in the world", finishing just after Richard Hammond in a Polo. ^ a b c Nick Hull (7 April 2003). "Jaguar XJ Design Development". Car Design News. ^ a b c d e "Press Release: THE ULTIMATE EXPRESSION OF JAGUAR LUXURY SALOON CAR ENGINEERING". Jaguar Cars. ^ a b c d e f g h "Press Release: New XJ at a Glance". Jaguar Cars. ^ a b "2005 Jaguar XJ8 Super V8". Road & Track. 6 November 2012. ^ a b c Tony Swan. "Jaguar Super V-8". Car & Driver. ^ a b c "Future Classic Friday: Jaguar XJ (X350)". Honest John. 23 June 2017. ^ Cheryl Jensen (22 June 2003). "BEHIND THE WHEEL/2004 Jaguar XJ8; A New (Aluminum) Way to Skin a Cat". New York Times. ^ a b c Oliver Marriage (25 February 2003). "Jaguar XJ8 3.5". Auto Express. ^ "Last of the Jaguar XJ X350 models". Jaguar-xj-blog.com. 1 March 2004. Retrieved 30 September 2010. ^ Nigel Thorley (1 April 2013). "Jaguar All The Cars,3rd Edition, 2013, p.278". Veloce Publishing. ^ Christopher A. Sawyer (1 December 2012). "Light On Its Feet". Automotive Design & Production. ^ "2008 XJ New Car Test Drive". Autoblog. ^ "Jaguar uses X350 car to pioneer use of self-piercing rivets" (PDF). Emeraldinsight.com. doi:10.1108/01439910110389344. Retrieved 30 September 2010. ^ Austin Weber (3 March 2015). "Assembling Ford's Aluminum Wonder Truck". Assembly. ^ Don Sherman (9 December 2014). "In-Depth with the 2015 Ford F-150's Aluminum, Presented In an Alloy of Facts and Perspective". Car & Driver. ^ a b Mark Rechtin (15 May 2006). 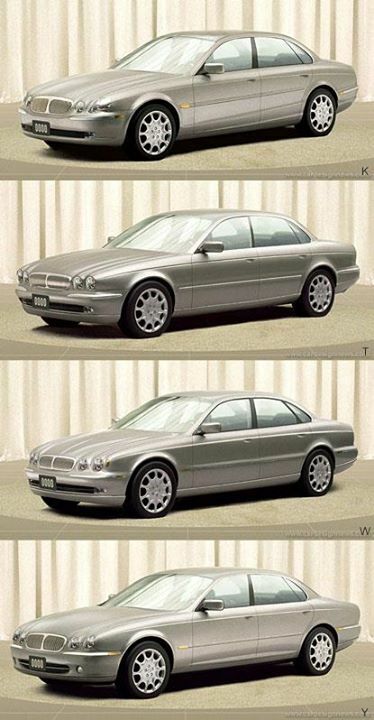 "Is the XK's use of aluminum an advance over the XJ sedan?". Automotive News. ^ "Ford's work with aluminum-bodied vehicles goes back decades". Automotive News. 10 January 201. ^ a b c "How do you make the Jaguar XJ even better?". Auto Spies. ^ a b "2004 Jaguar XJ brochure" (PDF). Jaguar Cars. ^ Marriage, Oliver (February 2003). "AlI cat pounces". Auto Express. Retrieved 23 February 2012. ^ "2008 Jaguar XJ X358 specs". Automobile-catalog. Retrieved 4 February 2014. ^ "2009 Jaguar XJ8 (X358)". Automobile-catalog. Retrieved 4 February 2014. ^ "Jaguar XJ8 X358 transmissions and fuel economies". Automobile-catalog. Jaguar Cars. Retrieved 4 February 2014. ^ "Switzerland to England in one tank". Top Gear. CarSite. Retrieved 5 February 2014. Wikimedia Commons has media related to Jaguar XJ (X350). This page was last edited on 15 April 2019, at 08:37 (UTC).